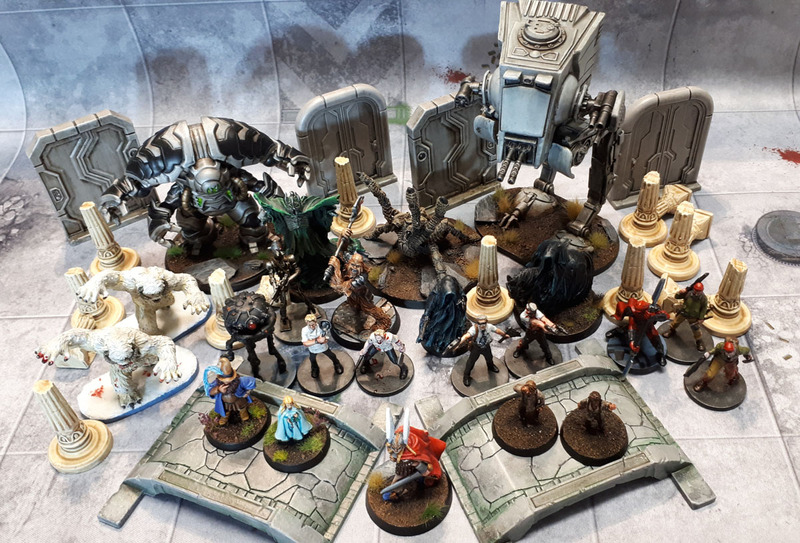 The Jewel of July – Personal Round-Up & July 2018 Painting Round-Up | Azazel's Bitz Box. How our plans go astray when the gaming gods intervene! 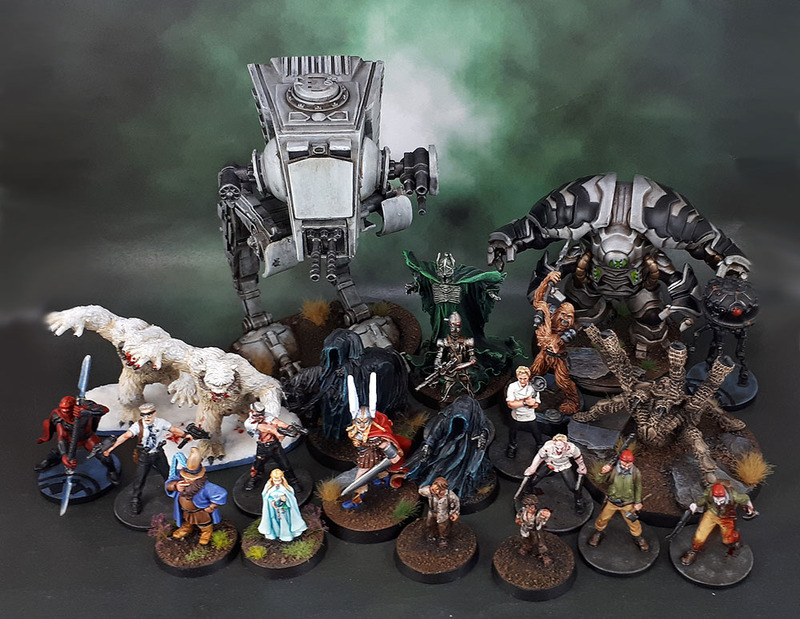 The Jewel of July was supposed to motivate me on a personal level to finish a bunch of small heroes and villains from various games, some large monsters and also get some of those Space Marine Heroes for my armies done. 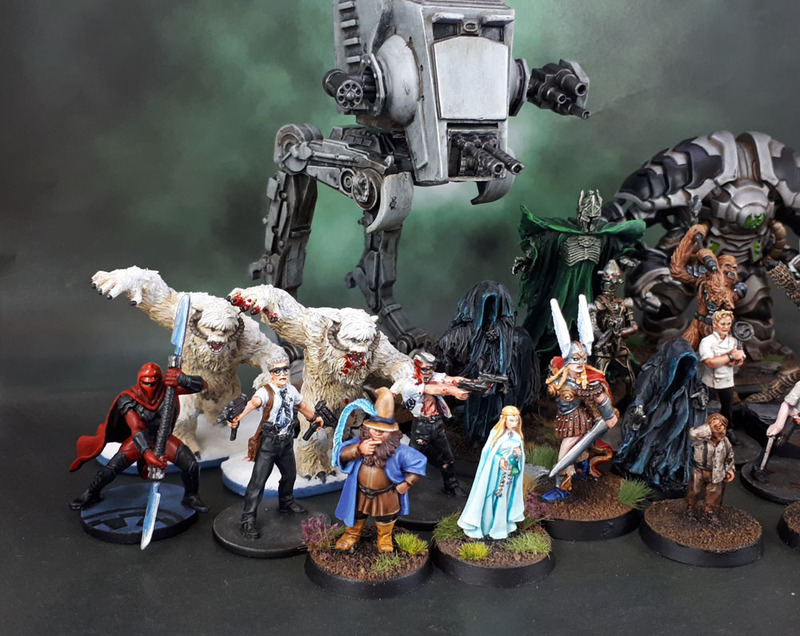 While I somewhat achieved the first of those objectives, my group’s beginning to meet again regularly after a couple of months’ hiatus – and the focus in our gaming sessions primarily being Star Wars Imperial Assault switched my previous painting of IA models from being somewhere to get some easy wins, mixed in with my other models (as with Shadows of Brimstone) into much more of a proper gaming focus for the month and into August. It’s not been a terrible month by any means, though it kind of morphed into a bit of a neglected model month of sorts (as so many tend to do) as I finally completed things like a sextuplet of Zombicide models representing both the living and (un)dead states of three Survivors that were started at least 2 years ago when we used to play Zombicide frequently. Since the only difference between my challenge models and my overall models this month was a few pieces of terrain, I’m combining both posts into the one, here. 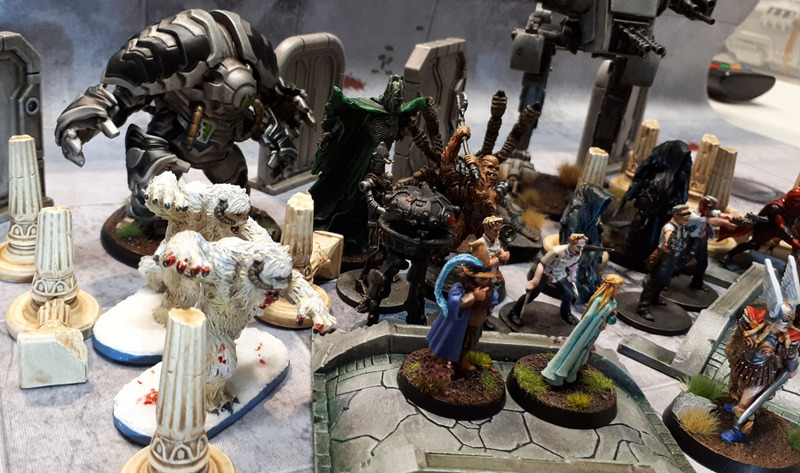 Aside from the Jewel of July models, the 10 ruined columns from Mythic Battles: Panthenon, the 2 bridges from Massive Darkness and the 4 doors from Star Saga provide me with a bunch of improved elements when I get to the appropriate boardgames, as well as an additional 16 pieces of scatter terrain for various wargames as needed. 16 pieces of scatter also works nicely towards my monthly goal of a minimum of one model of some sort for each day of that month – these smaller, but more frequent and constantly reset monthly goals are working a lot better for me overall than the broader “365 for a year.” My total for this month being the 23 for Jewel plus 16 non-challenge scatter terrain brings me to 39 models for this month. From Jan to June, I completed 343 models, so with the addition of July’s 39, I’m up to 382. More on that later, though! This entry was posted in Monthly Painting Challenges, Monthly Painting Round-Ups and tagged July Painting Round-Up, The Jewel of July Painting Challenge. Bookmark the permalink. Well, I don’t have any kids aside from Leonard the Cat, so I don’t have home-child-care duties, and I’m able to leave stuff out, unlike others who need to put everything away due to younger-cobra-children who like to …collect models. 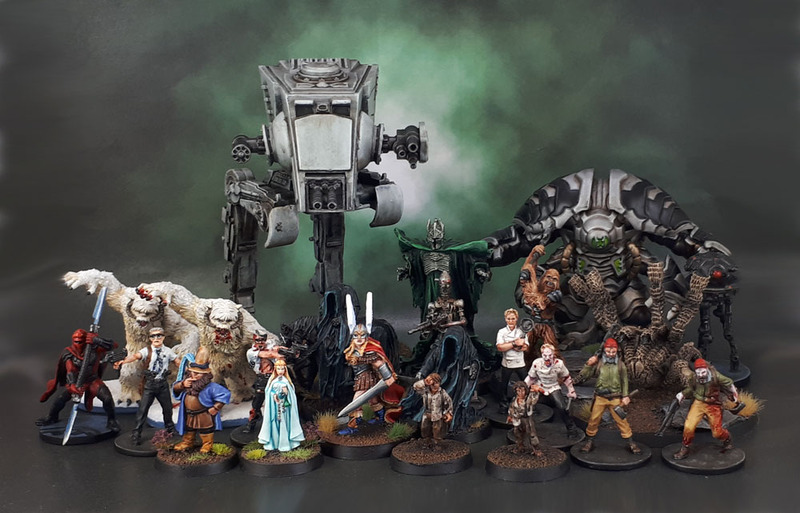 Related to that (and not the case this month), I’ve always got groups and squads on the go, that (theoretically) have a bit done here, a bit done there, and so a fair few models can come to fruition at once. One of the biggest things is probably that I tend to paint in the time that other people would watch shows or films on TV. So I’m like 12 movies behind in the Marvel series, I’ve only seen the first episode of Game of Thrones, not yet seen a single ep of The Walking Dead, kinda-paused in Season 2 of Breaking Bad, and… well, you get the idea. LOL “younger cobra children”. I know nothing of the sort! You’re right! I was lazy! I should have worked on that mass of treasure chests this month! Some may have had jewels inside! In all seriousness impressive work as always. What I do wonder though is where you put everything? 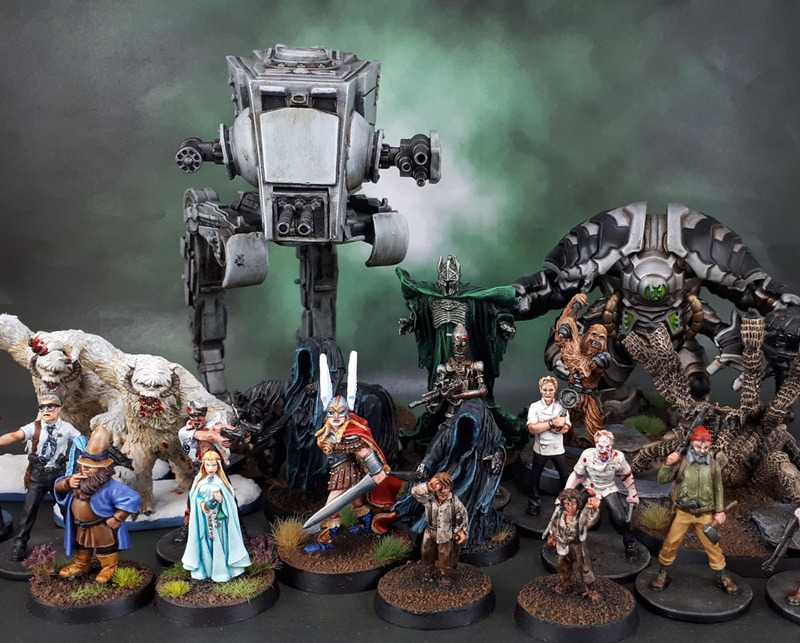 You’ve clearly been modelling for years and if each year you manage to complete 300+ figures then the total number of figures must be incredible and that’s not counting your “to do and neglected piles”! Enjoyed looking at every one of these. Superb effort (and seeing that you are slightly less productive than June reassured me that you are indeed human)! Now we also have Marouda’s work to see, so a nice family affair. Thanks Mark. I’ll have to break out the scatter terrain again to get the numbers up! 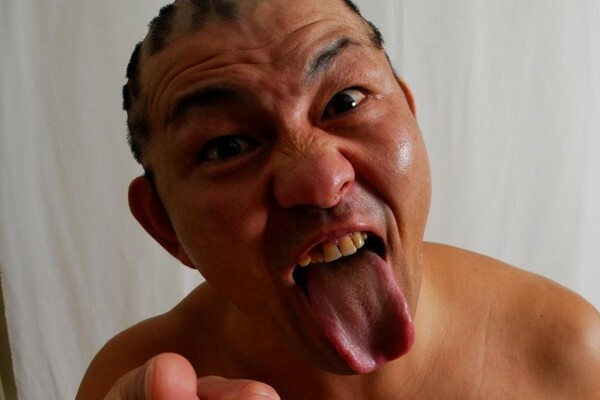 Hopefully Marouda can keep interested enough to keep going. Great work- You accomplished far more in the month than I managed. Nice to see ’em all gathered together! Excellent stuff! I’ll have fewer nightmares after seeing this lot, because although spiders get mentioned, there’s none of those pretty-creepy-looking-plants-that-you-insist-aren’t-real! Thanks, mate! I didn’t get that third one done, but I promise it’s still on my painting desk to get done! Bloody brilliant job mate. The roundups are always inspiring. Cheers, IRO. Community one up very soon! That’s some serious painting buddy! You’ve still got it covered in quantity, and that Viking Lady was a really nice quality piece. 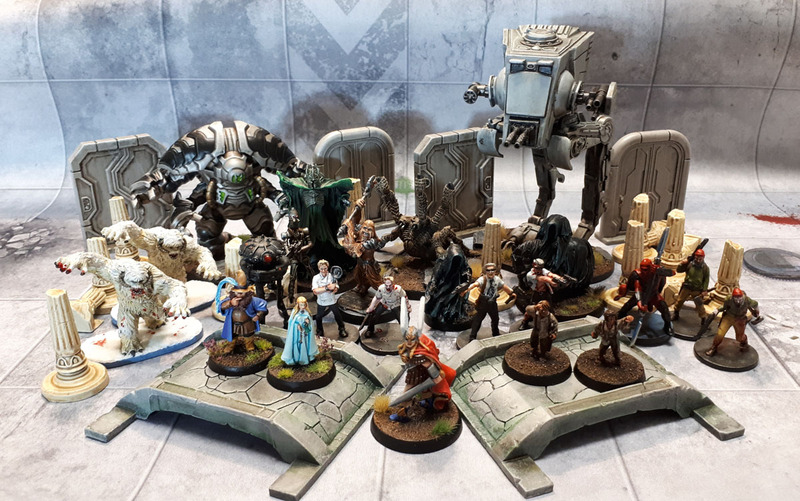 I’m pretty surprised at the scale, seeing all the minis in a group shot. That AT-ST is quite big. I thought the Wampas would be big, but they are dwarfed by some of the others. Sauron is tall too. He’s so tall, that I now forgive you for painting him green. He could be pink with polka dots and still put some fear in the standard sized minis. 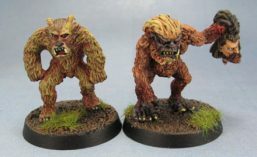 The Wampas are really small-ogre sized, but in relation to the rather slim Imperial Assault models their bulk is pretty decent. 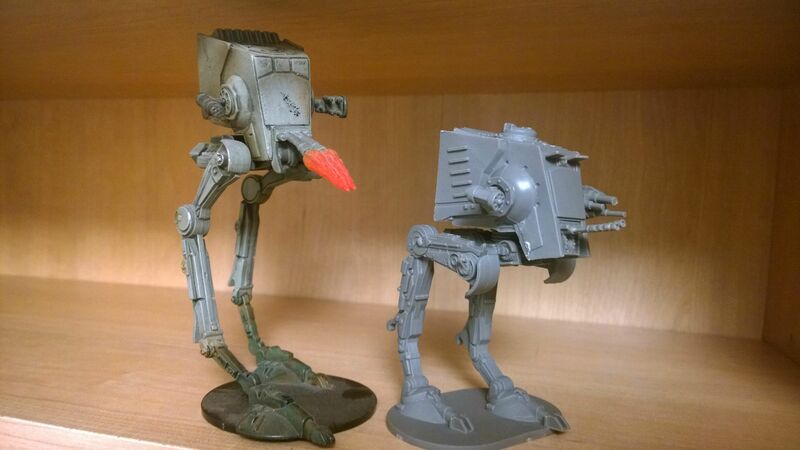 I do think they should be a little bigger overall when you look at them in ESB, but then, even the AT-ST is both undersized and “chibi” to what it should be – check out the old WotC collectable SW Minis AT-ST and and the new one for Legion (though that is scaled slightly larger). Awesome output mate, both in volume and quality – you are the painting equivalent of the T1000! Dude – slow internet is absolutely killing my WordPress reader and the new format where it doesn’t keep you logged in is killing my commenting! I am about a month behind on your posts, but all this looks amazing! Firstly, how are you finding Imperial Assault? I’ve not had a problem with my reader – WP isn’t logging me out on my PC or my tablet/phone… Though I haven’t updated to any new formats. IA is pretty fun, though the shortness of the campaign is a bit of a shame. Feels like now that we’re just getting the characters to a fun power level it’s about to end (we have 1 side, 1 main and the finale left). The mini-campaigns in the smaller boxed expansions seem really bloody short – we haven’t started on them yet, but yeah.. they seem really short.